For years, Yacoub moved from country to country seeking reprieve and refuge. Mauritania has been called “slavery’s last stronghold,” with an estimated 17% of the population still living in inter-generational slavery. As a child of the Wolof tribe, a disenfranchised ethnic group, Yacoub was forced into punishing labor and street begging by the prevailing religious school system in place of grade school. After several attempts to run away, Yacoub finally returned to his family’s farm, only to watch the 1989 Border War between Mauritania and Senegal erupt. During the war, his tribe and others were expelled from Mauritania creating a massive refugee crisis. Amnesty International has widely accused and condemned the Mauritanian government for carrying out institutionalized torture and inhumane treatment against members of targeted ethnic groups and political detainees. Stateless, unprotected, and vulnerable, Yacoub tried to return home to Mauritania but was met and abused by border police. He was burned, branded, and beaten, experiences which have created lifelong injuries. The violence suffered during his border detention led him to flee to the Americas to seek dignity and freedom — and so began a years-long journey across the globe to find safety and a second chance. He first made it to South America, making friends and joining a community. But without legal status, he realized that he would have to travel to the U.S. where he hoped to seek asylum and finally achieve safety. 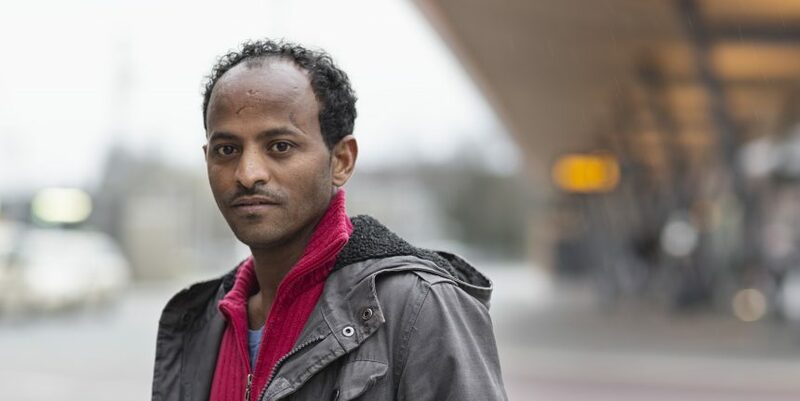 Yacoub arrived at the US border in 2013 and requested asylum. But like many refugees, he was shocked to find himself placed in immigration detention for several months —subjected to jail-like conditions which is a common practice in the U.S. Upon release, Yacoub began his work with PTV’s physician, a PTV counselor, and caseworker who helped to bring back a sense of safety and who helped him start to heal. PTV staff also helped with transportation and enrolled him in English classes. When he first came to PTV his gaze was permanently fixed to the floor. Three years later, his smiles light up a room and he speaks English, though shyly, with charm and increasing confidence. During his long search for safety, from the African continent to Brazil and Central America, Yacoub picked up five additional languages and speaks them all with ease and near fluency. After a six month wait for a work permit, he began working a humble job at a grocery store, sleeping where anyone would allow him. Yacoub was just happy to be in the world and able to persevere. With PTV’s help, he filed his asylum application with high hopes of achieving full asylum status. And most importantly to him, he met a woman at his mosque that he plans to marry next year! There is much for Yacoub to be hopeful for and his PTV team is inspired by his amazing resilience. Yacoub is awaiting the immigration court’s asylum determination with a renewed sense that the future can be brighter for him. Will you help bring hope to other survivors like Yacoub with a donation to PTV’s life-saving work? The name, image, and identifying characteristics of some clients may be changed to protect client confidentiality and the safety of family and friends that still live in the client’s country of origin.